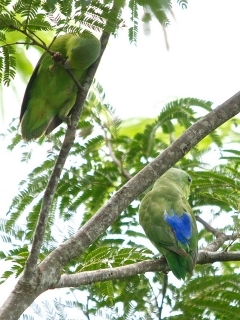 The Blue-winged Parrotlet nests in tree cavities but will also try arboreal termitaria (termite mounds in trees). F.x. xanthopterygius: Male-in general olive/green to green in colour; eyes surrounded by bright green; purple/blue primary and secondary coverts; purple/blue bases to outer webs of secondary feathers; purple/blue underwing coverts, lower back and rump. Bill horn in colour with grey at base of upper mandible. Eye dark brown. Female-green instead of blue markings; green/yellow forehead and face. F.x. flavissimus: Male-paler, more yellow/green; yellow/green forehead, cheeks and throat. Female-paler and more yellow/green. F.x. crassirostris: Male-paler blue markings; pale gray/purple primary coverts; dark purple/blue secondary coverts; smaller in size. Female-green less yellow overall. F.x. olallae: Male-as in crassirostris, but darker purple/blue wings, rump and lower back; paler underwing coverts. Female-as in crassirostris. F.x. flavescens: Male-as in xanthopterygius, but yellow/green paler; green/yellow forehead, cheeks, and underparts; paler blue on lower back and rump. Female-as in xanthopterygius, but yellow/green paler. F.x. xanthopterygius: As in adults but immature male has blue markings intermixed with green. Calls in flight or when perched are sad sounding albeit penetrating. While feeding twittering and chattering. 2 x 1 x 2m (6.5 x 3.3 x 6.5 ft) enclosure, or suspended indoor cage 120cm x 40cm x 50cm (46.8" x 15.6" x 19.5"), with roosting box. Seed mix such as: millet, canary grass seed, weed seed, wheat and oats; millet spray, sprouted or unsprouted; fruit such as: apple, pear, orange, banana, pomegranate; vegetables such as: carrot, celery, green beans, peas in the pod; berries such as: rose hips, mountain ash (rowan); green leaves such as: Swiss chard, dandelion, chickweed, lettuce; insectivorous food; complete kibble if taken. Provide tree stumps, branches (are avid chewers); areas for bathing. Nest log 15cm (6") in diameter, 30cm (11.7") high or 6" x 6" x 6" (15cm x 15cm x 15cm) vertical box. This species is not felt to have been affected by the wild bird trade. F.x. xanthopterygius: NE Argentina in Misiones, NE Corrientes, E Chaco and E Formosa; and from Paraguay north through central and mideastern Brazil to N Bahia. F.x. flavissimus: NE Brazil, from Maranhao, Ceara, and Paraiba south to N Bahia. F.x. crassirostris: NE Peru, E Ecuador and SE Colombia east along both sides of Amazon River and smaller riverlets to C Amazonas, N Brazil. F.x. olallae: found in Codajas and near Itacoatiara, on N bank of Amazon River in E Amazonas, N Brazil. F.x. flavescens: CE Peru south to E Bolivia, in Beni and Santa Cruz. Prefers drier wooded habitats such as open and riparian woodland, cerrado and caatinga; also found in savanna, palm groves, semi-arid scrubland and pastures. Found also along Amazon River in lighter riparian growth. Eats fruits of Cecropia, seeds of Mikania and Trema mirantha and flowers of Ambrosia and Marcgravia. Will forage in the open and sometimes on the ground. Highly social; found in groups of up to 50 individuals.